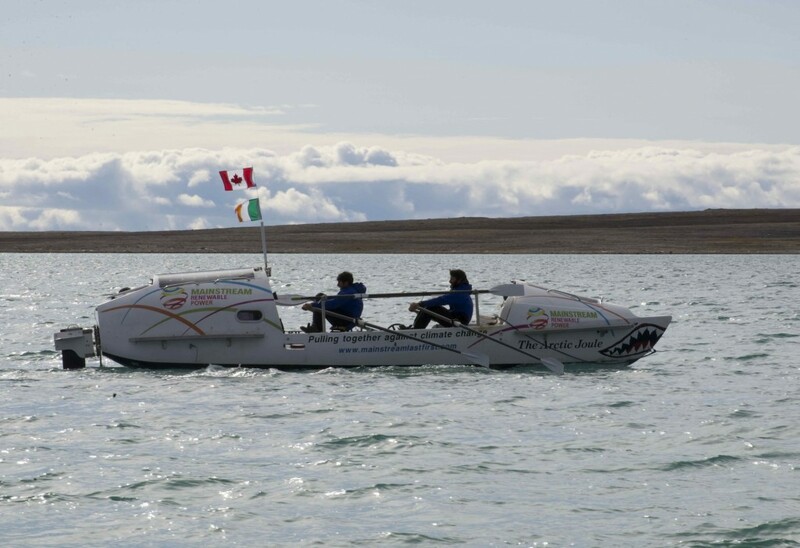 We row into Cambridge Bay, Nunavut this afternoon – August 28th, 2013 to officially conclude the Mainstream Last First expedition. The snow squalls that dogged us earlier in the day have lifted and blue sky and sun greet us as we end our journey. It feels like a fitting end. 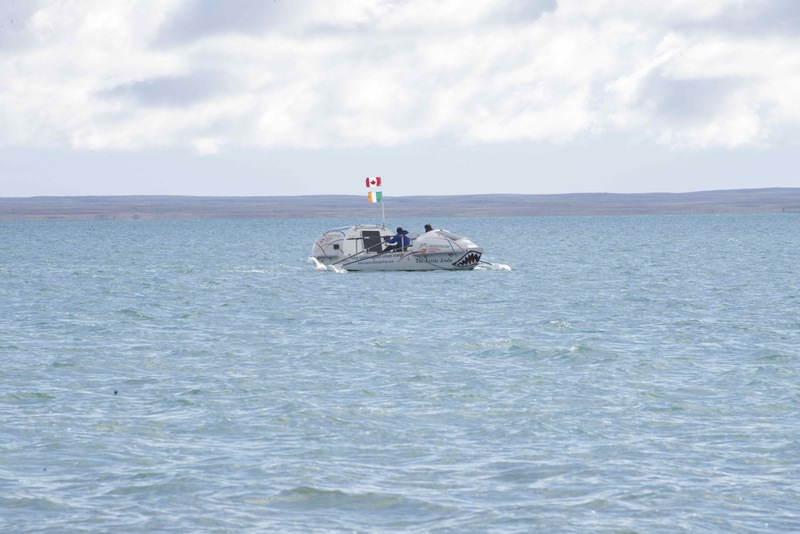 Over the past 54 days we traversed more than 1500-kms of the Northwest Passage from Inuvik, NWT to Cambridge Bay, Nunavut and come away humbled and awed by the experience. We had hoped to make it to Pond Inlet, Nunavut by early September but this has proven impossible. 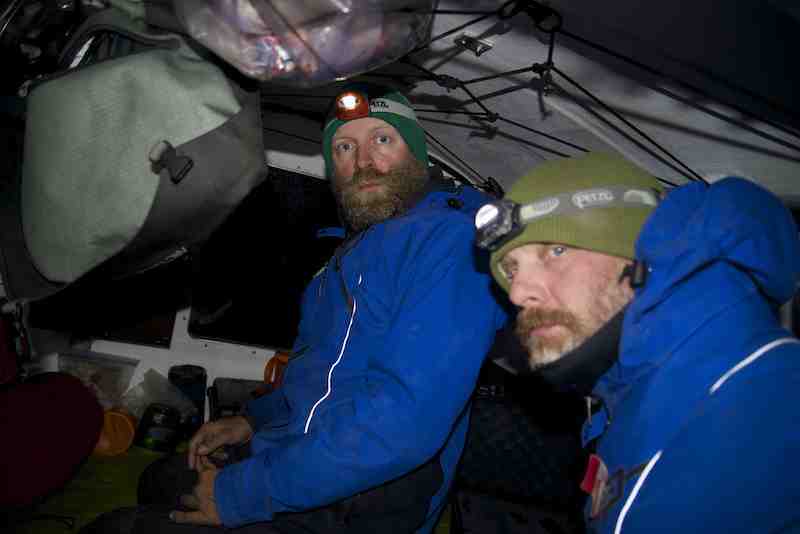 Severe weather conditions hindered our early progress and now ice chokes the passage ahead. The days are getting significantly shorter now and the temperatures are dropping fast. Our intention all along was to make it to Pond Inlet by mid-September as the lack of light and colder temperatures would significantly curtail our movement and slow us down. Extrapolating from our current rate of movement, even if there was no ice in the passage ahead, we’d require at least another 50-60 days to make it to Pond Inlet. Throw in the issues of less light, colder temperatures, harsher fall storms and lots of ice blocking the route and our decision is easy. Moving forward at this point would be foolhardy and hubris won’t force our hand. 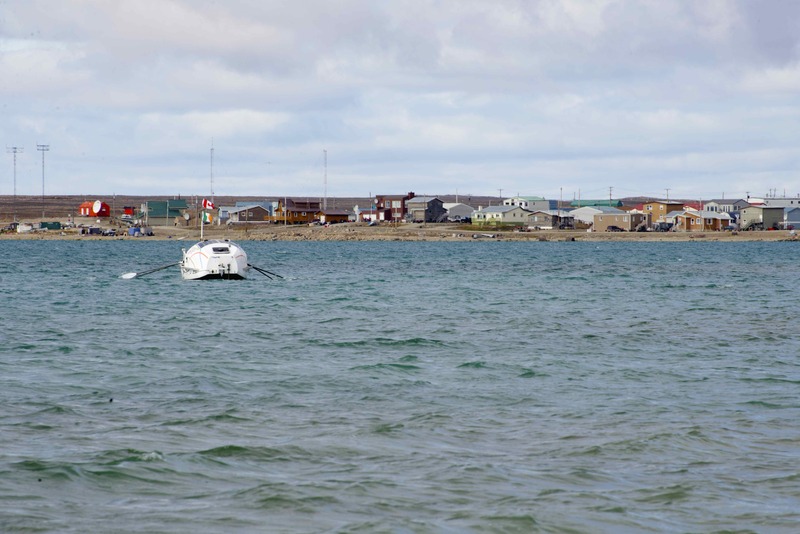 Cambridge Bay, Nunavut is our final port of call. We’re disappointed that we’re unable to reach our intended destination of Pond Inlet but this disappointment is tempered by the knowledge that we’ve done everything in our power to achieve our goal, a goal whose outcome wasn’t wholly under our control. Our message remains unaffected though, bringing awareness to the pressing issues of climate change in the arctic. The expedition has opened our eyes to the issues like we never imagined. We’ve experienced the arctic in a truly unique way and have had the privilege to speak with the people that live here and to hear their stories on climate change. And they’ve told us lots. Floyd Roland, the former premiere of the North West Territories and the current mayor of Inuvik speaks of winters that now begin a month later than when he was a kid, of strange and inconsistent weather patterns that were once far more predictable. Elders Billy and Eileen Jacobson of Tuktoyaktuk speak of winters shortened by a fortnight at either end, of grasshoppers in the arctic, of grizzly bears and wolverine further north than ever seen before. Daryl Nasagaluk of Tuktoyaktuk speaks of beavers now appearing in arctic waters, damming the rivers and destroying the run of white fish. Hank Wolki in Paulatuk speaks of the thinning sea ice that surrounds his community, of the dangers of winter travel within a warming arctic. Marlene Wolki of Paulatuk speaks of a shifting winter season, of picking blueberries in late September during a time when the land was once frozen, of an ice-free Darnely Bay in October, something unheard of when she was young. Brothers Joe and Steve Illisiak in Brown’s Camp tell us of grizzly and polar bears interacting now, of the new hybrid bear on the scene – the pizzly and the grolar, of rarely seen pods of killer whales prowling their waters. Joe Ohokannoak tells us of grizzly bears on Victoria Island now, of ravens being common place where once they never ventured. The arctic is changing and it’s changing dramatically. We know this because the people that live here tell us so. The Inuit have a word ILIRA. It has no equivalence in the English language but it’s a word that defines our journey. Ilira is the sensation you feel when you glide down the waters of Franklin Bay under a setting sun with sulfurous plumes of smoke erupting from the hillsides beyond and a giant bow head whale surfaces just meters away. Ilira is the feeling you get when you go to sleep at night facing a mirror smooth ocean bay and awake to a cauldron of sea ice, churning and grinding in it’s place. Ilira is the sensation when a 9-ft barren lands grizzly stands on it’s hind legs, discovers you’re there and slowly walks towards you. Ilira is the sensation of rounding a precipitous rock walled cape in gentle seas knowing that bad weather is on it’s way and in seconds your world could be chaos. Ilira is the gentle flush of fear that comes with awe. Ilira has defined our journey through the waters of the Northwest Passage. The expedition challenged us in ways we couldn’t have imagined and we dodged a number bullets along the way. The bullets came in the form of a pan of multi-year ice intent on running us over in Franklin Bay, in the form of wind, storm and current wanting us to experience the grinding pack ice of Darnley Bay all close-up and personal, in the form of a southerly wind so strong we’re powerless as it pushes us out into the Amundsen Gulf. But with the bullets also came the wonder: a beluga whale rising inquisitively from the surf mere meters away, stumbling upon the ruins of an ancient Thule site on secluded bay we never intended to visit, watching the horizon twist and bend and turn upon itself as the heat and cold from air and water played games with our mind. 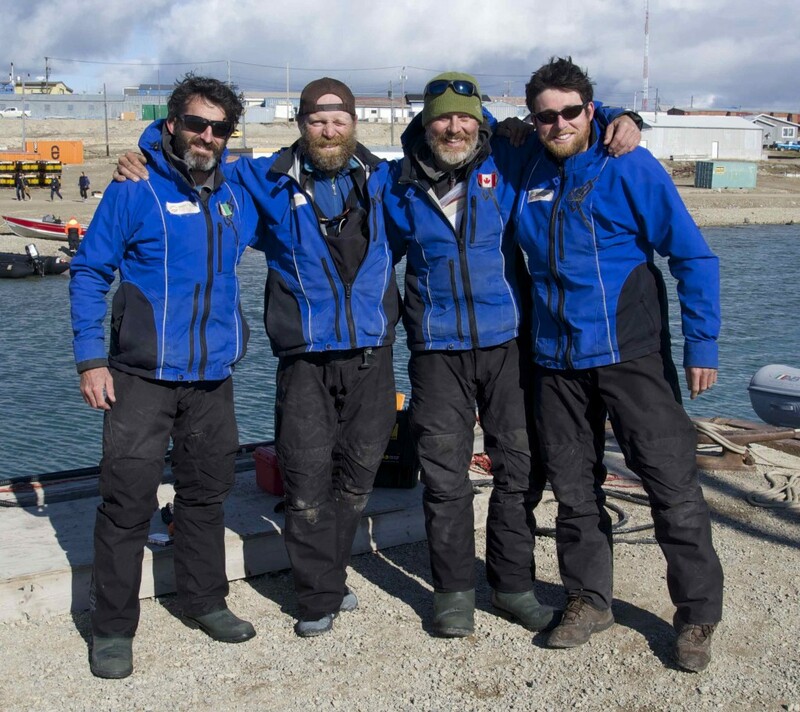 We would like thank Eddie O’Connor and Mainstream Renewable Power who, through their generous support, allowed us to undertake this expedition and to speak to the pressing issue of climate change in the arctic. We want to thank our team of sponsors and supporters – a list far too long to list here – who have helped us throughout this journey. Without them we could have never got here. And, of course, we want to thank our family and friends who have had the confidence and patience to see us through this endeavour. Without them on side none of this could have ever happened. We fly home tomorrow, our heads still spinning with the experience. Thanks so much for following!! We’ve had mixed weather over the last few days. We made great progress from Sunday morning through to Monday evening. The temperatures dropped off a bit – probably a few degrees below freezing. While rowing on Sunday morning, I had 4 layers of upper body clothing on inside my dry suit, 3 layers of leggings, 2 pairs of socks, a pair of gloves with an extra inside liner, 2 hats and a pair of wellington boots. Despite all this gear and the fact that I was rowing, it was still a bit nippy although it did warm up into the afternoon (so I took one of the hats off). On Sunday night we got our first glimpse of the Northern Lights which were absolutely magical. This was something we all hoped we would see up here so to finally get to experience these while out on the boat was amazing. The lights were like a cross between mad shaped animals and green mime artists dashing about the clouds in random directions. My words just can’t do justice to what we saw but needless to say it was very cool and for me was something I’ve always wanted to see firsthand. Our last major crossing was Wellington Bay, we completed this 35km crossing on Monday afternoon so we are now well and truly into the home stretch. We got hit by some stiff headwinds just as we finished the bay crossing so we spent all night Monday and most of Tuesday on anchor. We’ve had some problems with our water maker over the past week or two and now it’s not working. Well it’s still running but producing top notch salt water so a very important piece of equipment is done. I think the bashing of the boat while anchored during the stormy weather has in some way damaged the actual desalination unit. We had a look at it today, the filter system is fine but the reverse osmosis unit (which is the part that takes the salt out of the water) is not working as it should. Having salt water with meals and drinking salty coffee isn’t much craic so we went ashore, found some fresh water and filled up both tanks on board which gives us 80 litres. That should be more than enough to get us over the line. If we need to, we can go ashore again to find more fresh water. 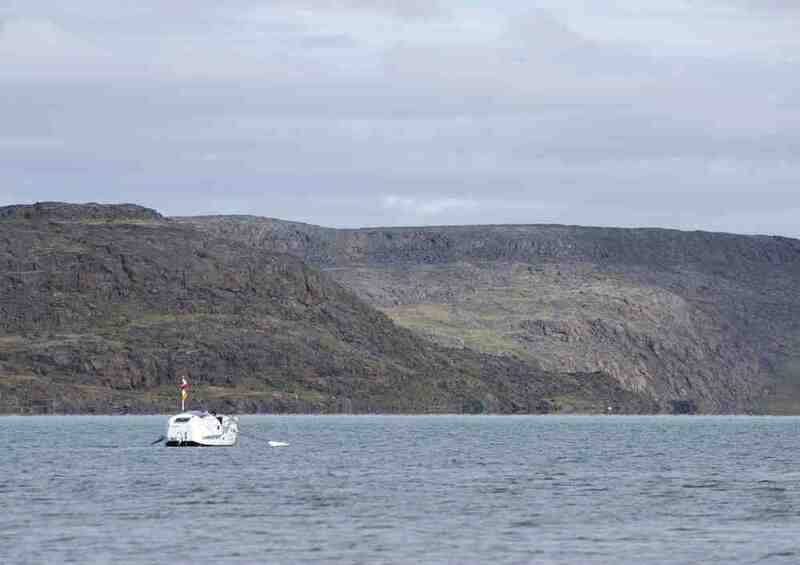 We also had a visit on Tuesday evening from two locals (who had stopped by on Monday as they were heading out to a hunting camp – namely Arctic Char and Caribou. They very kindly offered us some Arctic Char fillets and we happily accepted. Frank fried them up straight away with a little oil and some lemon pepper. It was absolutely delicious, possibly the nicest fish I have ever eaten. We could nearly feel the energy seeping back into our bodies. This was the first time we have eaten something fresh in a long time. Even Denis who doesn’t eat a lot of fish was beside himself with how good it tasted. Being pummelled by sustained 100-kmph winds that gust even higher is an unnerving and humbling experience. I’ve endured winds like this in a tent only twice before (while skiing to the South Pole in 2008/9 and when traversing frozen Siberia’s Lake Baikal in 2010) and each time I remained awake through the ordeal certain our tent would be destroyed. But the tents weren’t destroyed on those two times and our tent isn’t destroyed this time either. 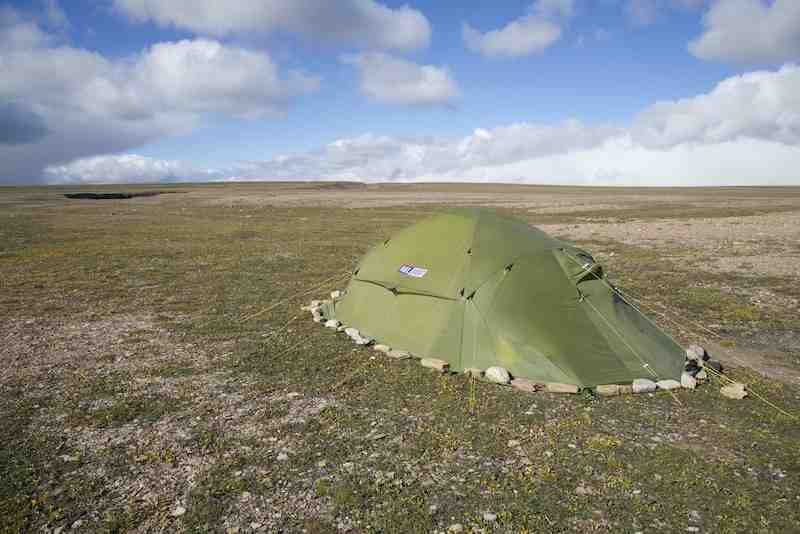 The tent is the 4-season Svalbard from Norwegian tentmaker Helsport. It may be a shameless plug but I can’t imagine a better quality product for keeping you alive. This past spring a skier attempting a traverse of Greenland’s icecap lost his tent is a windstorm and died from exposure. The value of a durable tent can’t be overstated in a harsh arctic environment. The Arctic joule takes a hammering too and by the end of the storm her deck is covered in a layer of fine gravel, her rearview mirror is smashed, her hull paint is partially removed from the constant abrasion from the beach and two of her sealed hatches are compromised and filled with sea water. Like a boxer in a difficult prize-fight, she’s taken a beating in a later round. She’s is in her corner now and she’ll be ready when the weather bell sounds. Being stormbound has given us the opportunity to explore the surrounding landscape and we’ve ventured out hoping to see more. Muskox dot the hillsides, their numbers abundant in what must be an arctic haven for them but only an arctic wasteland. We set out up a large river valley that creates a distinctive sinuous rift cutting sharply into the landscape as it meanders away from the sea. 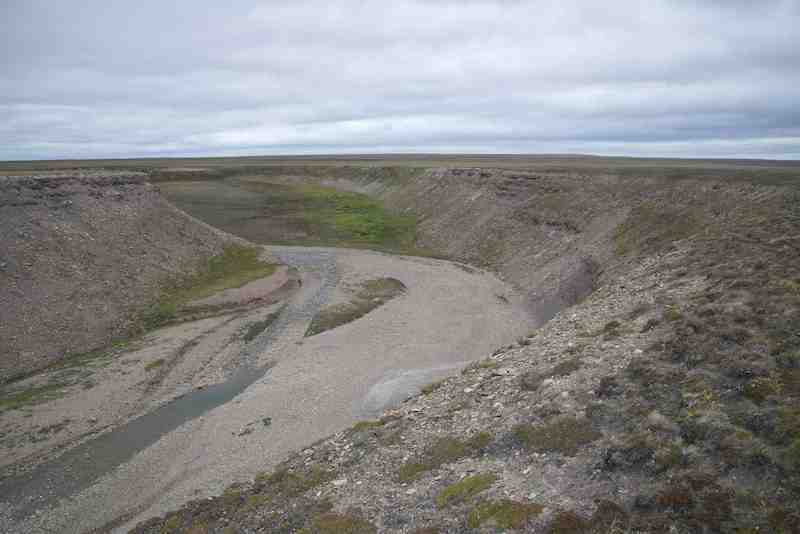 The valley walls are a mix of steep tundra and crumbling bluff that spill onto to a bed of river rock below. Only a trickle of water meanders through. The landscape heightens as do the walls of our valley and after an hour of walking we slip down to the river and follow it back to the boat. Dwarf birch and willow tussle for space and cower from the wind. The splash of lingen berry bushes explode against the brown and green of the scrub and caribou bones are scattered everywhere. Bands of exposed rock reveal a greenish tinge as they disintegrate on their airy perch. Copper I surmise, a valley of resource for the south. 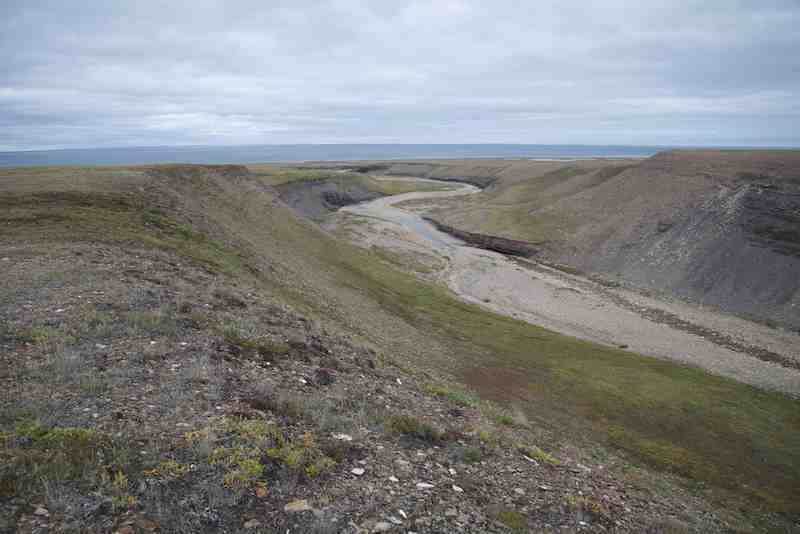 The community of Coppermine (Kugluktuk) is just a short distance away. Does man’s hand really need to come here, to this truly wild place? Escape finally comes after spending three nights and we begin rowing in earnest with a moderate northwester pushing us obliquely down the coast. We point the bow to shore and row to offset the vector of northward push while the vector of westward push moves us along at a comfortable 4.5-kmph. It works well if the wind isn’t too strong, too strong would mean pushing us out to sea. We row continuously for the nest 36 hours and elect to row through the night even though evening brings complete darkness now. Rowing in total darkness is best done on quieter seas and is an altogether different experience than daylight rowing. On this night we are entertained with a display of northern lights streaking green across the southern sky, like mist caught in the rays of a midnight sun. By morning we’ve made it far enough the coast to start our traverse of Willingdon Bay. The 32km crossing is committing, as all big crossing are, and we move with a light southwesterly pushing us from behind. Fortunately it’s only in the final 7kms that the winds shift and intensify and has us struggling to shore. We’re camped in the lee of Cape Enterprise and await calming winds to start moving East to Cambridge Bay. The novelty has now officially worn off being wet and cold…. The misery I spoke about before is now just miserable! The good news is that we are within reach of the end point where a warm shower and a bed are on the cards. It’s a funny thing, I am trying so hard not to wish away the last few days. I know my bed will be there waiting for me in four days or fourteen but I may never be back in this harsh but wonderful place. Trying to stay in the moment is very difficult. We sent the best part of two years putting this expedition together and I spent every waking moment looking forward to it. What the hell was I thinking! I suppose when I have time to reflect on the trip once it’s all done and dusted, I will forget the rough times. When I’m on the oars, I’m constantly thinking about the pleasures of home, these guys are awesome and I have made friends for life (I’m not sure what the lads would say about that!!) but 70 days in total in the constant company of three hairy, and now very smelly men is just starting to get old. Myself and Paul were trying to work out how long it would take for friends to clock up the hours that we have all clocked up in each others’ company. There is not much about these guys I don’t know now. 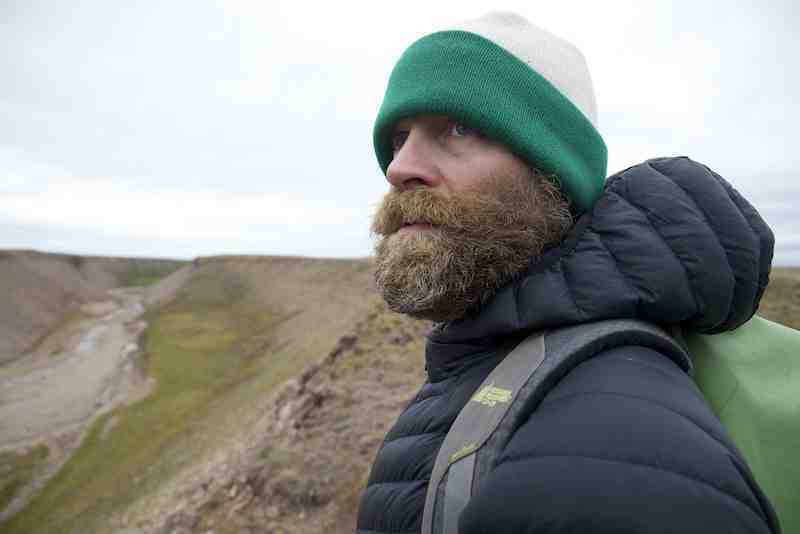 If I was to try and sum them up, Kevin is an academic trapped in an adventurer’s body, Frank would have been right at home driving a dog team in the late 1800′s, Paul is a record keeper constantly taking notes in his little diary, and I’m not sure what I am apart from bloody freezing, hungry and exhausted! The funny thing is that every time we think we are making progress and start planning forward, something happens to stop us in our tracks, like literally as I type this I hear the lads talking about the fresh water supply… it’s basically become contaminated with sea water. So now the priority has changed from charging on to Cambridge Bay to looking for a creek on the shore to fill some water tanks from, talk about a curve ball… right that’s me off to find some water I suppose…… did I mention I’m cold? P.S. I’m loving every minute still, bed can wait. One of the habits the late Stephen Covey speaks about in his best selling book 7 habits of highly effective people is “beginning with the end in mind”. This simple but in my opinion highly effective idea is something I use in my own life and often discuss with clients. After 2 days of stormy winds, we got going again today and I think we were all definitely beginning this morning with the end in mind. This has been an incredible experience so far but I know I am ready to get this done now and get to Cambridge Bay. We were chatting about this earlier today and we’re all on the same page. Depending on the weather, we’re anything from 2 to 5 days out. At this stage, we should know better not to try and plan how long anything up here will take but with the end so close it’s hard not to. The temperature has dropped off a bit over the last few days so a real bed, a hot shower and a warm meal sound very appealing right about now…. The walls of the tent are shaking and shuddering violently. Several strong gusts push the tent fabric right down upon us, the tent poles giving way to the extreme force. The guy wires are as taught as cables and prevent the poles from breaking, large stones hold down the perimeter of the fly and help keep us stuck to the ground. Can our tent survive this pounding? Clearly our storm has built way beyond a gale. We sail into our current camp on a strong southwesterly that literally pushes us faster than we can row. By cranking the rudder away from land and then letting the on-shore wind do its thing we move along at a comfortable 5kmph running exactly in the direction we want to go. Rowing the Arctic Joule requires pointing the bow more towards shore – the forward propulsion pushing her away from land – and produces an inconsistent movement that before long has us correcting course, heading in and out. The back and forth proves slower than doing absolutely nothing at all. It’s bizarre and it’s magic, the arctic giving us a freebee for the moment. Our joy ride lasts about an hour until the wind swiftly changes direction and hints at the big nasty that awaits us. It’s our cue to hit shore. The beach is moderately steep and we haul The Arctic Joule as high up on it as we can. There are no large boulders to anchor our pulley so we fill our large packs with gravel and use them as dead weight to haul by. It’s a gap stop solution but its all we can do. The Arctic Joule weighs over 2000lbs and doesn’t manhandle easily. Our storm builds and so does the surf. The Arctic Joule begins to get pounded. 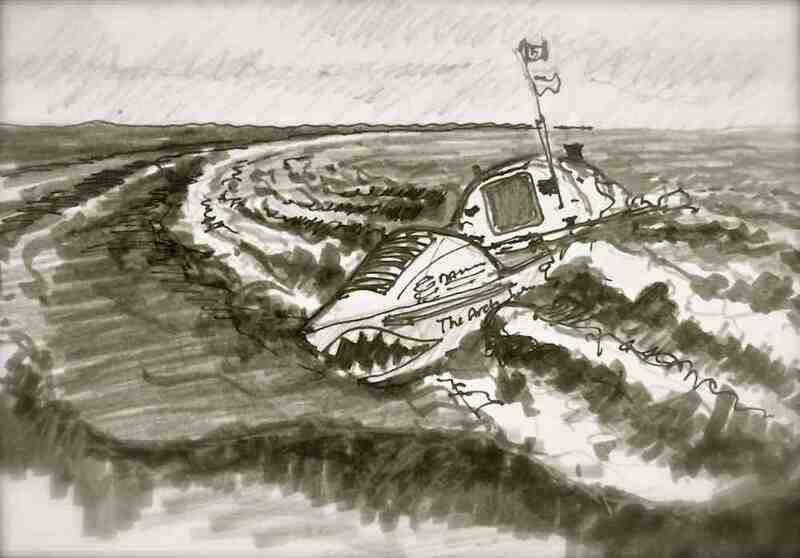 We’re genuinely concerned that the boat could work itself loose and be blown out to sea. The wind blows off-shore and an unanchored Joule would be carried away as swiftly as a feather in the wind. We put ourselves on a round-the-clock monitoring vigil until the wind dies down. I write this blog from the vestibule of our 6-person tent. It’s the middle of the night (my less-than-ideal shift of 4am-6am is the result of a loosing score in our evening game of hearts) and the wind is howling all around me. Every few minutes I visually check on the boat, every hour I check on the guy lines of the tent. The updated forecast is for sustained 55KN winds (100kmph) with gusts potentially 40% greater. I have a steaming cup of soup in my lap, my journal in my hand and my shotgun at my side. It all feels strangely familiar to me now.